In the new CamPerform Cyclone series, Optronis presented one of the first cameras to feature the new CXP-12 interface at VISION. 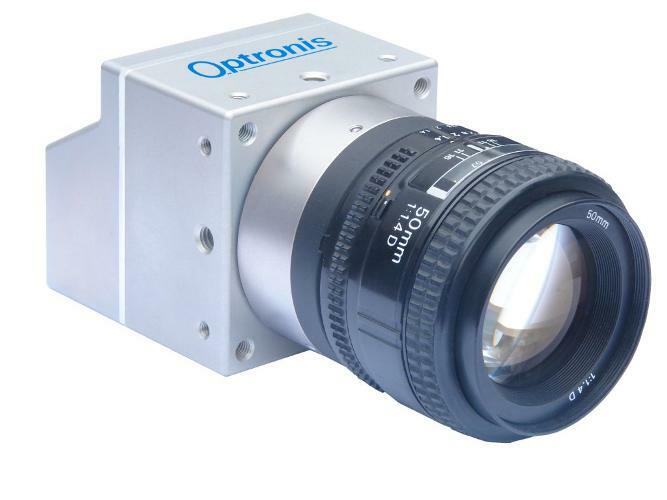 The modern series is set to establish new benchmarks in machine vision performance: with four channels and a volume of 12.5 Gbit/s per channel, the CamPerform Cyclone cameras from Optronis transmit a data volume of 50 Gbit per second. The CamPerform Cyclone uses the latest CoaXPress version 2.0 interface, CXP-12. By doing so, the CamPerform cyclone cameras achieve a rate of 50 Gbit/s via four CXP-12 channels. This data transmission rate brings faster results for 2D and 3D measuring tasks in machine vision such as AOI, laser profilometry and additive manufacturing. The first available models in the CamPerform Cyclone series have a resolution of 5 megapixels at 700 images per second (Cyclone 5 700), or a resolution of 2 megapixels at 2,000 images per second (Cyclone 2 2000). The frame rate of the Cyclone 5 700 can be increased to up to 75,000 images per second at a resolution of 2,560 x 16 pixels, making it particularly attractive for laser triangulation. With their performance capacity, the CamPerform Cyclone cameras form a distinct series. Depending on the camera parameterization, precise measurements up to well over 100,000 images per second can be achieved. “With the CamPerform Cyclone, we are offering an entirely new level of performance in data transmission. For our customers, we are thus expanding our range of high-speed cameras once again by adding an outstandingly innovative component,” says Dr. Patrick Summ, managing director of Optronis.